We offer comfortable holiday apartments for 2-6 people in Serrig an idyllic wine village on the River Saar in beautiful Rhineland-Palatinate, the area where Germany, France and Luxembourg meet. Our holiday apartments are tastefully furnished and have been awarded four stars by the German Tourist Board. On this page you will get information about our apartments. This 70 m² apartment Steffi comprises a spacious living room with an integral fully-equipped kitchen and dining area , two bedrooms with double beds, a bathroom with bath, separate shower and wc, a hall and a large balcony with impressive panoramic views. The apartment contains Sat-TV, radio and CD-Player/DVD-Player and is very suitable for 2-4 people. A baby's cot is available on request. In the 40 m² apartment Corinna you will find a living room with integral fitted kitchen and dining area, a bedroom with a double bed and a bathroom with shower and wc. This apartment is also equipped with Sat-TV, radio and CD-Player/DVD-Player. The apartment is best suited for 2 people, but 2 further guests could use the comfortable double bed-settee in the living room. Our guests have the use of the garden with lawn, a shaded arbour, children's swing and barbecue. We have detailed maps and brochures to assist in planning cycle or hiking trips. On request we offer guided cycle or mountainbike tours. There is an off-street parking and a garage for bikes for your use. Included in the price are bedlinen, towels, heating, water and the final cleaning. For stays of less than one week a charge of 40 Euro will be made for the final cleaning. Your holiday home is the ideal starting point for lots of places of interest in the village and surounding area. Ideally situated for hiking in the nearby forests or cycling on segregated cycle paths along the River Saar. 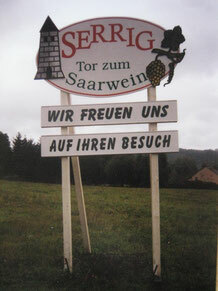 We look forward to meeting you in Serrig.